November 13, 2010 by Fr. C.
The Saint Alban’s crew are even now cheering the Sun Trust Half-Marathon and full-Marathon runners and giving breakfast to the onlookers. I don’t think I ever have been asked for many blessings at one time. 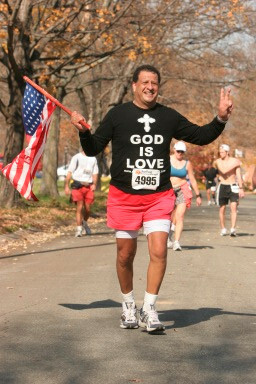 Apparently, like foxholes, there are not many athiests running marathons! We’ve gotten a lot of, God bless Saint Alban’s” shouts back at us. A great day in our neighborhood in Richmond! Thanks to our parish administrator Ms. SimoneRhodd for organizing this outreach. Now, where are my running shoes?